It’d been a long time since I laughed out loud while reading a book. A really long time. But Diptakirti Chaudhuri’s latest book has just about managed that. I laughed, chuckled, and nodded my head several times in the midst of reading the book. “BollyBook – The Big Book of Hindi Movie Trivia” is Diptakirti’s third book, the first one being one on cricket, and the second being the precursor to BollyBook, “Kitnay Aadmi Thay” (KAT). It was a genre shifting Bollywood book in the sense that it did not chronicle the travails of film making or profile some specific stars, but it just focused on Bollywood trivia and did a fine job of that. 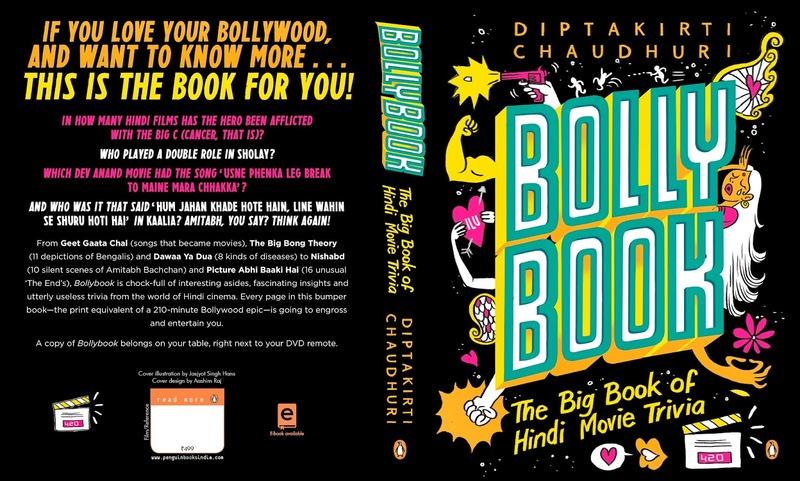 BollyBook is expected to release in October, 2014. The initial idea, as Diptakirti says on his blog (diptakirti.blogspot.in), was to pitch BB (indulge me as I acronymize the book titles) as a sequel to KAT, but then his publisher at Penguin suggested the idea of a combining the two as a comprehensive and definitive book rather than having a sequel. And thus, BB was reborn in a new avatar. Just like some Bollywood characters do, some would say. With 19 sections and nearly 460 pages that are packed with interesting trivia and more, the book can definitely live up to the claim of being the definitive book of Bollywood trivia. Good, bad, funny, dark, all sorts of trivia make up this book. Written in his inimitable style, often sparkling with humour and wit, the book is a paean of sorts to Bollywood. Today I may count myself a fan of filmmakers such as Scorscese, Linklater, or Fincher, but my first introduction to cinema came through the works of Manmohan Desai, Yash Chopra, and others. Back then, we didn’t have a VCR or DVD at home. There were no multiplexes. Going to the movies meant walking to the neighborhood theater, 15 minutes away from home, standing in queue for “first day first shows” or “matinee shows” for a 10 or 20-rupee ticket. Satellite (cable) TV was not yet introduced in my little town. Regular TV broadcast used to a mix of very old to medium old movies. Religious festivals often heralded special community-screenings in an open-air environment where a projectionist would “show” the picture on a vertically mounted white chaddar. Regardless of the venue or the medium, we watched in awe as those larger-than-life stories unfolded on the screen. Chitrahaar, the weekly programme showcasing hit Bollywood songs, was our reason for going “TGIF”! This, in essence, is what Diptakirti would call a pre-credit backstory compression (hint: see the book to understand what this term really means) to explain my fascination for Bollywood. It doesn’t matter whether you’re a 70’s, 80’s, or 90’s kid. The book has something for everyone. The earlier generations will nod their head at the various retro references, while the newer ones will easily connect with the new age trivia. Although the table of contents mentions lists, the book isn’t packed with boring ones, instead many trivia are presented in anecdotal form, with a surprise twist here and there. Did you know for instance that the Tamil Nadu CM Jayalalitha acted as second lead opposite Dharmendra in a movie named Izzat? Or that Dev Anand was an employee of the Indian Postal Service and perchance grew to know of Gurudutt who lived in the same chawl as him and became thick with him? Many more such interesting nuggets fill up the book including those about movies you thought you knew in and out, only to discover that you actually don’t. A remarkable trait of the book is that it isn’t restricted to mentioning trivia regarding only actors and actresses, but also takes a good look at the others who play an important part in a movie’s success. In a chapter covering regional superstars, for example, the last para brings to fore the most successful crossover by a regional musician who has gone on to make a name for himself in the international arena. A. R. Rahman. That’s who. There’s also a whole chapter devoted to films within films, called Meta. The amount of research the author must have undertaken for this book can be gleaned from this chapter alone where he not only recounts meta and self-referencing films/directors but also points out bloopers! All trivia and no interestingness makes a dull book. And Diptakirti is no dull author. He makes neat use of quizzes, Honorable Mentions and little Alerts (Eg, Subtle Mythology Alert) to break the pattern now and then. Chapters are also occasionally peppered with photos and posters. All in all, for Rs. 370 – paperback or Rs. 318 (Kindle), this book packs quite a punch, just like some of our Bollywood films. If you count yourself as a Bollywood fan, this book is a must-have for your bookshelf. Footnote: Our very own mFC finds a small mention in the section on low-profile debuts of actors.